Seeing two deer outside my family room window this morning and writing the post, The View While Tying Flies, I wrote these words: “Both deer were good-sized, but with no fawns. Though it is still early for that, but any day now the does will start dropping their fawns.” Indeed! I took a short nap a while ago, and was awakened at 5:45 PM by my Cocker Spaniel, Abigail, quietly woofing in the front living room bay window. I knew she saw something, that’s what she does. Before I put my glasses on – I’m near-sighted – I thought it was a turkey or perhaps a hawk on the ground. 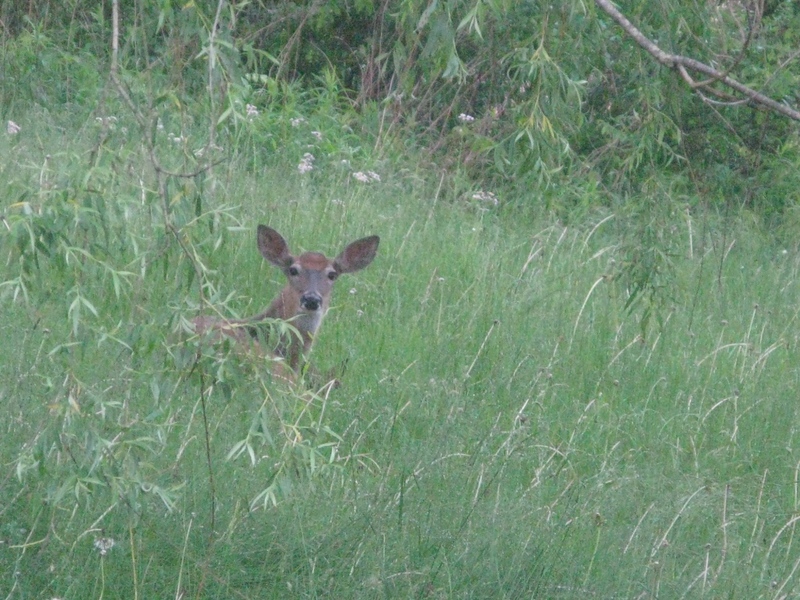 Correcting my vision with my glasses, I looked out to see a doe bedded down in my yard, under the weeping willow tree. I went upstairs to get a better view, and when I did, something tiny moved next to the doe. It was a fawn! Immediately I went for the camera. My tripod was fortuitously placed beside the bay window, because that is where I setup to shoot most of my flies, on a TV tray, next to the window. I like to use natural daylight, no flash. After retrieving the camera, I carefully went through the kitchen and dining room to screen my approach. I bent down, mounted the camera on the tripod, moved the tripod into position, turned the camera on, set it to custom timer, and took these photos. Doe and fawn in my front yard. Even at the first, the doe had noticed my movements. This is a section of the yard that I would have been mowing today, had it not been raining. I’m not sure if they just bedded down there, or whether she actually gave birth in my yard. The doe obviously is curious by the slight movement she sees in the window. Her attention is riveted on me. The fawn is heading back to its mother. 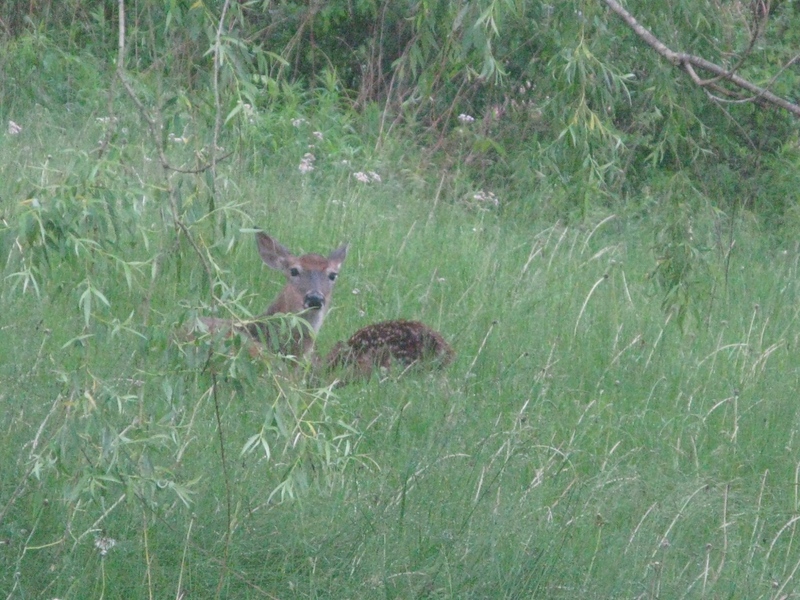 Bedded down beside its mother, the fawn is barely visible, except for the tips of its ears and top of its head. This is an amazing time of year for the white-tailed deer. 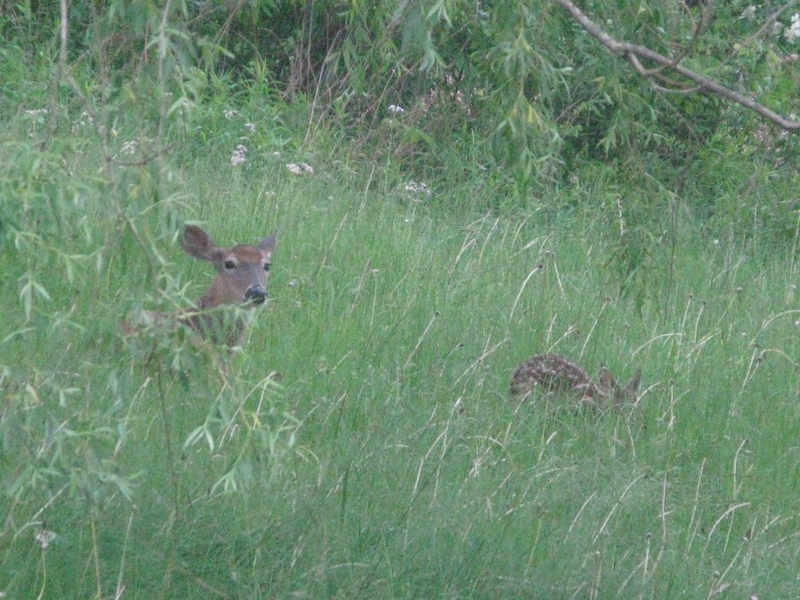 I have plenty of stories garnered over the years of seeing deer with fawns while fishing in late May and early June. One of the best, and I have a 35mm slide photo to remember that fawn – I was using my Olympus OM-1 with a 70-210 zoom lens. Back in the mid-1980’s, I always carried my camera while fishing. That lens will not focus closer than six feet. As I was trying to get shots of a fawn along a creek near out family cabin, the little guy became curious and came right up to me. Initially he got so close that I could not focus the zoom lens. Then he kept coming to me and leaned his head out and sniffed my right leg, leaving a wet spot from his nose on my hip boot. I’m going to grill a bacon cheeseburger for dinner, and enjoy some of my home-made potato salad as a side. 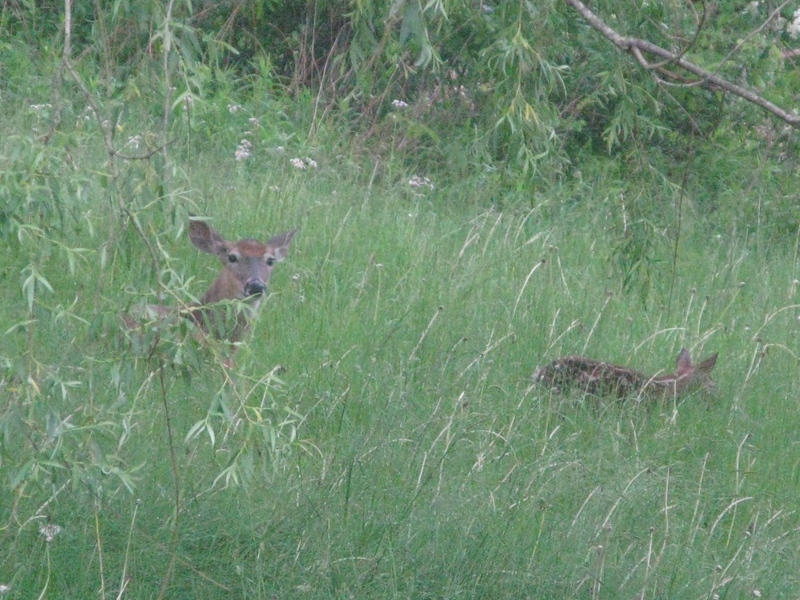 Good thing the gas grill is on the back patio, hopefully I won’t disturb the doe and her youngster. Nice picture, Donnie! It’s awesome that you got to see the fawn. Thanks for alerting your Dad, Abigail! Thanks for your comment! Take care Rich, and have a good summer! Great story Don. Loved the photos! I’m glad you liked the photos and story. Always appreciate your comments!